GIVE THEM: The gift of smooth lasting flavor! Finally, a wine device for both connoisseurs and newbies! Since not all of us have a well-stocked wine cellar, most wine consumed has not aged to peak perfection. BevWizard miraculously smoothes the tannins found in young or inexpensive wine, making it taste richer. Developed by Master of Wine, Patrick Farrell, the patented innovative technology combines an aeration device with a magnetic field to soften bitter tasting tannins revealing the underlying fruit flavors. 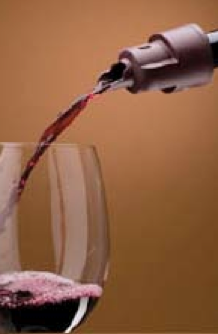 The pourer easily attaches to any wine bottle, providing noticeably remarkable results. Additionally, the BevWizard Spirits Smoother softens the bitterness of most wood matured spirits, including bourbons, scotches, whiskys and cognacs. Even I was able to drink Jim Beam! At $27.95 a great gift for him or her and easy to travel with. Just one of hundreds of Tango Diva selected gift ideas for the travelers in your life!